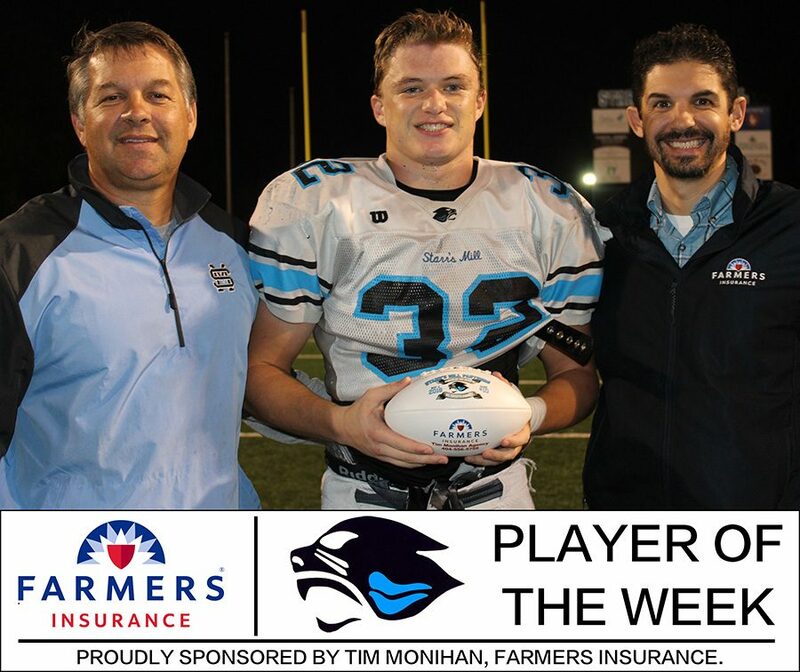 Tim Monihan and Farmers Insurance have presented senior Michael Burnett with the 14th Player of the Week award for the 2018-2019 school year. Last Friday, Burnett and the Panthers kept the Fayette County offense at a stand still allowing only 51 total yards. The Panthers forced the Tigers to punt on every offensive possession. The 27-0 shutout of the Tigers helped Starr’s Mill clench its third-straight region championship. Burnett and Starr’s Mill, the No. 1 seed from region 3-AAAAA, host the New Hampstead Phoenix’s, the No. 4 seed from region 2-AAAAA, at home to kickoff the playoffs. The Phoenix’s are traveling all the way from Savannah, Georgia, for tonight’s first round of the GHSA State Playoffs.